Robert Burns, a Scottish poet and a lyricist, is widely regarded as the national poet of Scotland, and is celebrated worldwide. He is perhaps the best known of the poets who have written in the Scots language, although much of his writing is also in English which is accessible to an audience beyond Scotland. His pieces that he wrote in English are his political or civil commentary and are often at its most blunt. He is regarded as a pioneer of the Romantic Movement and his influence has long been strong on Scottish literature. 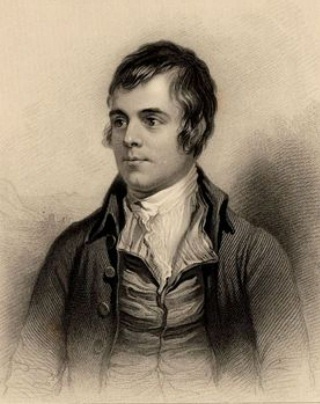 Burns was born two miles south of Ayr, Scotland, on January 25, 1759. He was the eldest of the seven children of William Burness a self-educated tenant farmer from Dunnottar and Agnes Broun the daughter of a tenant farmer from Kirkoswald, South Ayrshire. He was born in a house that was built by his father (now the Burns Cottage Museum), where he lived until Easter 1766, when he was seven years old. William Burness then sold the house and took the tenancy of the 70-acre Mount Oliphant farm, southeast of Alloway. This is where Burns grew up in poverty and hardship, and the severe manual labor of the farm left its traces in a premature stoop and a weakened constitution. He had very little regular schooling and got much of his education from his father, who taught his children reading, writing, arithmetic, geography, and history and also wrote for them A Manual Of Christian Belief. After a few years of home schooling, Burns was sent to Dalrymple Parish School during the summer of 1772 before returning at harvest time to full-time farm laboring until 1773. By the age of 15, Burns was the principal laborer at Mount Oliphant. He became old enough to try his hand at several different professions-none which worked out for him. In addition during this time he began writing poetry that reflected the people and events that were important in his life. He continued to write poems and songs and began a Commonplace Book in 1783. His continued on as well with half-hearted attempts at farming. His casual love affairs did not endear him to the elders of the local community and created for him a reputation for dissoluteness amongst his neighbors. His first illegitimate child, Elizabeth Paton Burns was born to his mother’s servant, Elizabeth Paton as he was embarking on a relationship with Jean Armour. Jean bore him twins in 1786, and although her father initially forbade their marriage, they were eventually married in 1788. She bore him nine children in total, but only three survived infancy. During a rift in his relationship with Jean Armour in 1786, and as his prospects in farming were declined, he began an affair with Mary Campbell to whom he dedicated the poems The Highland Lassie O, Highland Mary and To Mary in Heaven. Their relationship has continued to be the subject of much conjecture, and it has been suggested that they may have married. They are reported to have planned to immigrate to Jamaica, where it has been widely claimed Burns would have worked as a bookkeeper on a slave plantation. Before the plans could be acted upon, Mary Campbell died suddenly of a fever in Greenock, Scotland. That summer, he published the first of his collections of verse, Poems, Chiefly in the Scottish dialect, which created a sensation and has been recognized as a significant literary event. Burn’s next romantic conquest was Jenny Clow who bore him a son, Robert Burns Clow in 1788. His relationship with Nancy concluded in 1791 with a final meeting in Edinburgh before she sailed to Jamaica for what transpired to be a short-lived reconciliation with her estranged husband. Before she left, he sent her the manuscript of Ae Fond Kiss as a farewell to her. It was at this time that Burns became a collector of old Scots songs and was filled with a determination to preserve them. On his return to Ayrshire on February 18, 1788, he resumed his relationship with Jean Armour and took a lease on the farm of Ellisland near Dumfries but quickly gave up farming as he was writing at his best, and in November 1790 had produced Tam O’ Shanter. As his health began to deteriorate, Burns began to age prematurely and fell into long fits of despondency. The habits of his youth are said to have aggravated his long-standing rheumatic heart condition. Supposedly his death was caused by bacterial endocarditis exacerbated by a streptococcal infection reaching his blood following a dental extraction in the winter of 1795, and it was no doubt further affected by the three months of famine that affected the countryside. His funeral took place on July 25, 1796, the day his son Maxwell was born. A memorial edition of his poems was published to raise money for his wife and children, and, shortly after his death, money started pouring in from all over Scotland to support them.